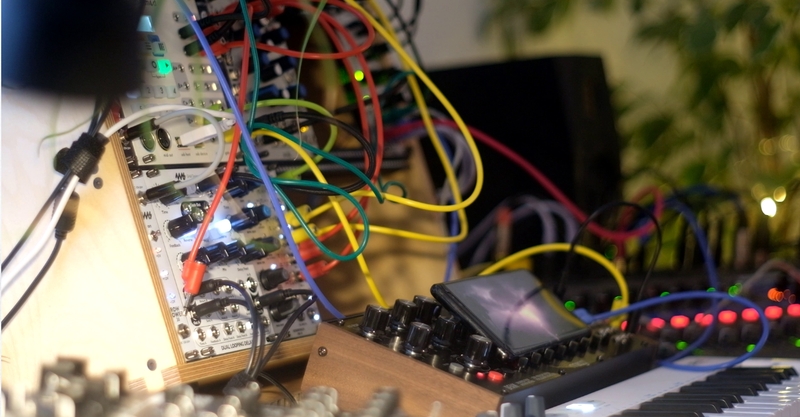 Vajra is an experiment in generative music on the modular systems. For this I used the Squarp Hermod sequencer to push out two sequences of random pitches quantized to a D flat scale. The ALM Akemie’s Castle is fed a note at the start of every bar and its sound is modulated by an ADE-32 modulator sending out different LFO’s to the Castles operator inputs. What’s most interesting is how Plaits is triggered by the sound of a thunderstorm coming from my phone. I feed the storm through my mixer at a loud enough level so that when a crack of thunder occurs the Plaits responds. Below I have a video of the performance and a separate walkthrough video describing the patch.